Oh my. The things you whip up in a minute would take me weeks and months... I love your big nines! 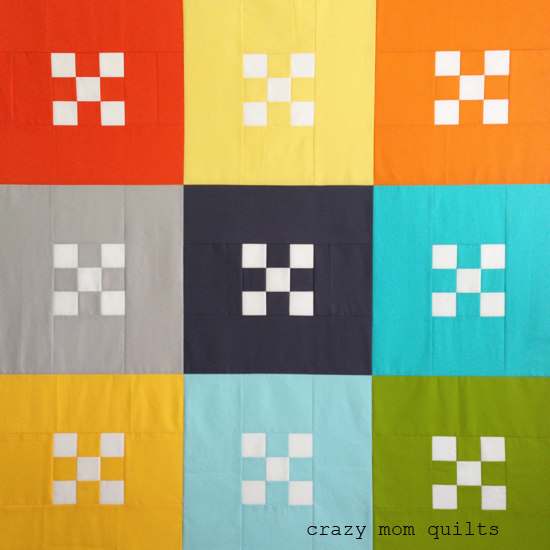 Such a simple quilt with big impact; love your color choices. And you're right, the backing shouldn't be hard to pick. This turned out fantastic! I love the simplicity of the design! Very cool quilt! I am constantly amazed at how quickly a quilt top can come together. Oh I love this - it would be fabulous in batik prints too - hmm, must go survey stash! I love the visual simplicity of this. It is bright and cheery, but still restful because of that simplicity. Such a simple quilt but great visual impact! I love this! Sometimes you just need easy with big impact! Great job! Beautiful, I love it! Simplicity works for me! Beautiful quilt Amanda-Jean but don't stop there, make it bigger. Solids have my heart.... 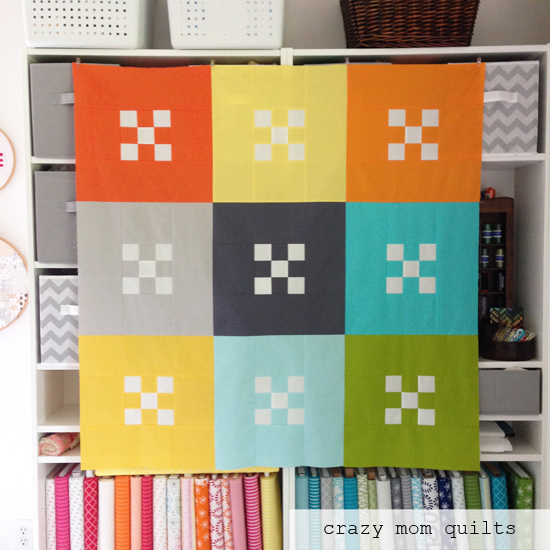 So this cute quilt top really appeals to me! Love the simplicity of the small nine patches in the large blocks. This is a lovely piece! I'm looking forward to seeing what you choose for the backing/quilting/binding. When I saw your post about this pattern the other day I wondered about trying it with fussy cut picture squares to replace the white ones. I might give it a go I think. I love your quilt top! And thank you so much for the tutorial. I think I'm going to use it to do a bit of stash busting ...it's time to clean out and this would be a great way to make some quick and easy, but still interesting, donation quilts. Love this quilt. It looks like buttons. Love the fabrics too. Hurry, hurry! 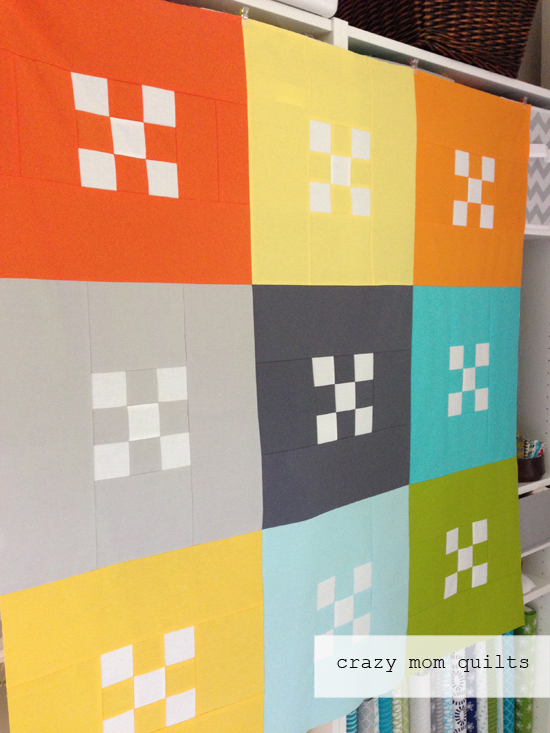 I love this idea and I'm excited to see how you've decided to quilt it! Too cute! I would never be able to make that as fast as you but I can so appreciate the need for a FO when everything's in process. Thank you for running your link up! Just managed to join in this week! Phew! "Big Nines" is such a great idea, although i haven't been one for solid colours ..... until now! I bought some solids for a printing project recently, must see if I have enough to make one. Thank you for running your recent blog hop ..... I was lucky to win an electronic copy of your book, and I 'm looking forward to getting time to sit, and take in some ideas from you.